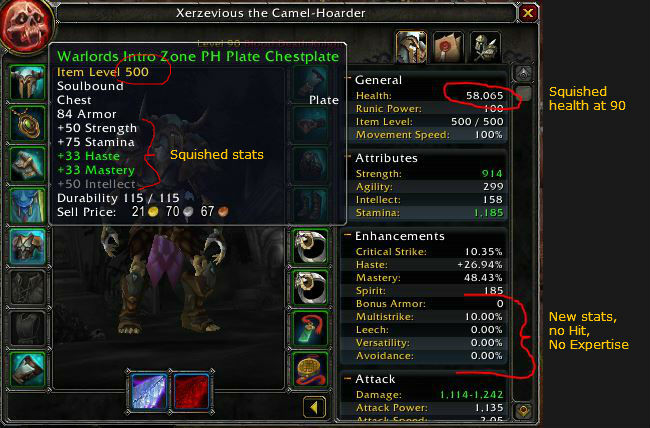 Note that the tooltips (when you hover over the link) reflect WoD info, not Mists of Pandaria info. The values of Attack Power and the amount of Parry you get from your Strength have changed for Warlords. Attack Power (AP) increases damage by 1 DPS for every 3.5 AP. Previously it was 1:14. This makes up for a change to Str based attack Power. Previously each point of Str provided 2 AP, now each point provides 1 AP. “The amount of Parry gained per point of Strength has been reduced by 25%.” Bliz likes the “active damage mitigation” model for tanking, as opposed to more passive effects, such as Parry. They’re not eliminating Parry as a stat, but it won’t appear on gear. Also, the Hit rules are changing: “All players now have a 100% chance to hit, 0% chance to be dodged, 3% chance to be parried, and 0% chance to glance, when fighting creatures up to 3 levels higher (bosses included.) ” Hit and Expertise are being removed from the game and will no longer appear on gear. Appropriate character racials will also change. The New Stats that all classes receive are Bonus armor (tanks only,) Versatility (more damage and defense,) and Multistrike (a chance for additional, weaker, attacks.) Readiness was in the early beta, but has been slain. It would have reduced cooldowns of various abilities. Clearly Bliz thought it was a bit too much. Warlords beta: Level 90 DK, item level 500, 58k health. The following changes apply to all specs of Death Knights, except where otherwise noted. Note that the tooltips (hover over the links) pull from WoWhead’s Warlords info, and not the Mists of Pandaria info, so the numbers probably won’t match current numbers. Diseases no longer increase the damage of abilities (such as Obliterate,) those abilities have been buffed to reflect this. Blood Strike has been removed, it’s replaced by Obliterate for Frost. Heart Strike has been removed. Blood Death Knights should use Pestilence in its place. Pestilence seems to have been removed. I can’t find it on WoWhead or in-game in the beta. Several abilities though refer to it, such as Scent of Blood. Necrotic Strike has been removed. Roiling Blood has been removed. See Blood Boil, just below. Blood Boil has been removed and its effects were merged into Pestilence. This change in effect turned Roiling Blood into a passive ability; which Bliz replaced with a new talent, Plaguebearer. This seems to be efficient, merging Roiling Blood, Blood Boil, and Pestilence into one ability. Rune of Cinderglacier has been removed. Rune of the Nerubian Carapace has been removed. Rune Strike has been removed. now replaced by Death Coil for Blood Death Knights. The cost of Death Coil will be adjusted down to 30 Runic Power, instead of 40. Raise Dead is now only available to Unholy Death Knights, summons a ghoul as a permanent pet, and has a 1-minute cooldown. This makes Master of Ghouls (which has been removed) redundant. Your Ghoul is now Unholy only. Army of the Dead is now Blood Spec only and now deals 75% less damage. Dark Command is now only available to Blood Death Knights. Plaguebearer is a new Level-56 talent replacing Roiling Blood, causing Death Coil and Frost Strike to also infect the target with Frost Fever and Blood Plague, or add a stack of Necrotic Plague. Pestilence now deals damage to all enemies within 10 yards, and spreads any diseases on targets hit to the other targets hit. It also now deals 50% more damage, but no longer deals additional damage for diseases being present on the target. Death Strike now causes healing that scales in effectiveness with attack power, instead of based on damage taken in the last 5 seconds. This healing is affected by Resolve. The Level-60 and Level-75 talent rows have swapped places. Unholy Aura now also provides 3% Versatility. Dark Succor is no longer a Major Glyph and is now a passive ability learned by all Death Knights at level 60. Death Coil now has a 40 yard range. Leveling your Death Knight should be the same “easy and fast” experience that it’s always been, just with a little less clutter and a smoother “rotation.” High level PvP and PvE should also be smoother, with fewer buttons and similar overall effect. At least that’s the plan. The are a number of changes to Blood Death Knights coming with Warlords. In general tanking should be much the same, but it will have a different feel, such as less healing and more shielding. DPS should be more in line with the rest of the group, instead of swinging way low on one fight and way high on another. Remember that Hit and Expertise have been removed and all classes and specs now have a 100% chance to hit all opponents up to +3 levels higher (eg: Bosses?) Attacks from the front have a three percent chance to be parried and tank classes have abilities to remove that 3%. Veteran of the Third War now also reduces the chance for attacks to be parried by 3%. Tank attacks have a 0% chance to be parried vs. creatures up to 3 levels higher. It also increases Multistrike chance, Haste, and Stamina by 10%, increases the damage of Death Strike by 100%, and grants 1 Runic Power per second while in combat. Vengeance has been removed and replaced with a new passive ability, Resolve, which increases your healing and absorption done to yourself, based on damage taken (before avoidance and mitigation) in the last 10 seconds. Previously it was also based on Stamina. No longer. Tank DPS will be increased to make up for the missing Vengeance. Blood Parasites has been removed, which will be a hit to healing. Scarlet Fever has been removed. Its effects have been merged into Scent of Blood. Scent of Blood has been changed. It now causes Pestilence to refresh diseases. In addition, your Pestilence, and your Soul Reaper, increase the healing done by your next Death Strike (within 20 seconds) by 20%, stacking up to five times. A new passive ability at level 80, called Power of the Grave, grants a bonus to Mastery to all Party and Raid members. Mastery: Blood Shield now also passively increases Attack Power by 8% (percentage increased by Mastery), in addition to its current effects. It also increases the effectiveness of Blood Shield and Rune Shield by 16% (percentage increased by mastery), instead of adding the Blood Shield effect. Army of the Dead is was briefly Blood only, now it’s back to being available to all DKs. Crimson Scourge now interacts with Pestilence instead of Blood Boil. It also increases the damage of Pestilence by 50% (up from 10%) and now also increases the damage of diseases by 30%. Rune Tap has been redesigned. It now reduces all damage taken by 40% for 3 seconds. It also now has 2 charges, with a 40-second recharge time. Will of the Necropolis makes your next Rune Tap free when health drops below 30%. Cannot happen more than once in 30 seconds. 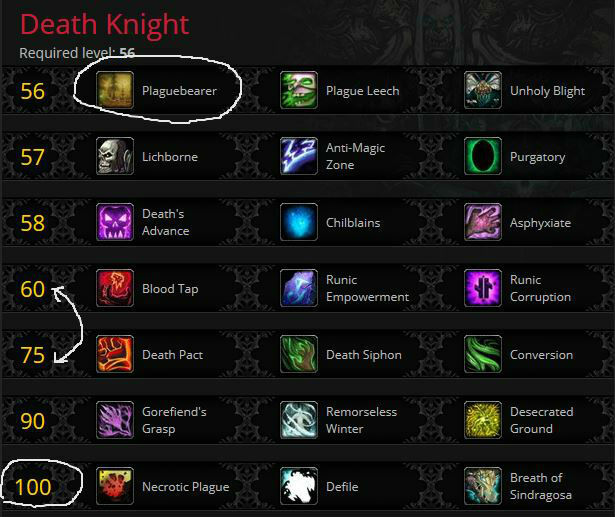 Riposte has been redesigned: Riposte now gives the Death Knight Parry equal to their Critical Strike bonus from gear. Improved Blood Presence no longer increases rune regeneration rate. It now increases all damage dealt by 15%, instead of increasing rune regeneration rate. Dancing Rune Weapon’s summoned Rune Weapon now remains fixated on the Death Knight’s target at the time of summoning, and copies the effects of Talents that are tied to the Death Knight, such as Blood Boil, Frost Fever, or Asphyxiate. Should the original target be dead or otherwise unavailable, the Rune Weapon will switch to assist with the Death Knight’s current target. It also now lasts only 8 seconds. Frost DKs are mostly tweaked instead of changed. Your rotations should be a bit smoother and you should still be a capable damage machine. Brittle Bones has been removed. Obliterate now deals 30% more damage on both main- and off-hand weapons, but no longer deals additional damage for each disease present on the target. Unholy Aura (Frost & Unholy) now provides a 5% increase to melee, ranged, and spell Haste to all Party and Raid members (instead of a 10% increase to only melee and ranged attack speed.) It also provides 3% Versatility. Threat of Thassarian has been removed and its effects have been merged into Might of the Frozen Wastes. Might of the Frozen Wastes now increases the damage of Obliterate by 50% (up from 40%) and melee damage by 35% (up from 30%) while wielding a two-handed weapon, and increases the damage of Frost Strike by 50% (up from 35%) while dual-wielding. As with Frost, the Unholy Death Knight is more tweaked and cleaned up than really changed. Necrosis is a new passive ability (gained at level 90) for Unholy Death Knights. Necrosis causes Multistrikes from Festering Strike, Pestilence, Plague Strike, Scourge Strike, and Soul Reaper to also deal a burst of Shadow damage. The amount of burst damage is based on Attack Power, not the damage from the triggering Multistrike. Scourge Strike no longer deals additional damage for each disease present on the target. The ability now deals 100% physical damage plus 50% as additional Shadow damage. These two effects can independently critically hit. Sudden Doom no longer reduces the cost of Death Coil. Unholy Might bonus changed from +35% back down to +10% (where it was in an earlier patch.) Apparently Unholy was hitting a bit too hard. Raise Dead is Unholy only and summons your permanent Ghoul. Master of Ghouls has been b. These are the talents as of May 15. Note that Roiling Blood is gone and the 4th and 5th tiers were switched. This was to give leveling DKs earlier access to faster rune regeneration. Also note that some talents, such as Death Pact, have changed somewhat. Roiling Blood is gone and it’s replaced by Plague Bearer. Your Death Coils and Frost Strikes now apply both diseases, which can be spread around with Pestilence. The tiers have been switched, supposedly to give leveling DKs earlier access to rune regeneration. Noty a big change, but some might find it to be useful. None of these talents have been greatly changed. Yet. Conversion was bto cost different amounts by specialization, instead of reducing Runic Power generation differently by specialization. This way, Runic Power beyond what you spend on Conversion is not penalized. Conversion no longer has an initial tick, and now costs 15 Runic Power/second for Blood, 20 Runic Power/sec for Frost, and 10 Runic Power/second for Unholy. Necrotic Plague replaces Blood Plague and infects the target with a disease that does damage over the next 30 seconds and every time it ticks it tries to infect another nearby target. (Q: Can it re-infect a target?) It is applied by anything that applies the regular diseases. You also gain Runic Power when attacked by N. Plague infected opponents. Will the Weakened Blows still apply? Defile looks like the Lich King ability. It defiles the area and increases in both area and damage (every time it does damage) over the next ten seconds. Enemies standing in the defile do less damage to you. Replaces Death and Decay. Breath of Sindragosa uses your Runic Power to continually deal Shadowfrost damage to the enemies in a cone in front of you. It lasts until you either run out of Runic Power or you cancel it. It also applies Mark of Sindragosa, which will heal you for 5% of the spell damage dealt by afflicted enemies. Also see our level 100 talents post for a rundown of all the level 100 talents for all classes. There are a few changes coming to glyphs, the big one being that now some will be automatically learned as you level, just as with talents and abilities. Naturally other glyphs will be changed, poked, prodded, and tweaked. Naturally a few will be removed. One other change of interest is that glyphs will be grouped into categories and only one glyph of a category can be installed at a time. As an example, there are several glyphs that deal with your Chains of Ice and you can only use one of those at a time. These are the new glyphs, some of which might well be pretty useful. Glyph of Absorb Magic: Increases the total damage absorbed by Anti-Magic Shell by 100%, but Anti-Magic Shell no longer generates Runic Power. Keep in mind that you can only have one “anti-magic shell” glyph installed at a time. Glyph of the Ice Reaper: Reaping is now also triggered by your Chains of Ice. Glyph of Icy Runes: You gain an additional 10 Runic Power when you use Chains of Ice. Glyph of Empowerment: Your Empower Rune Weapon also heals you for 30% of your maximum health. Glyph of Necrotic Strike: 50% of all healing absorbed by Necrotic Strike heals you. Glyph of Raise Ally: Your Raise Ally ability no longer costs any Runic Power. Glyph of Rune Tap: It now reduces Rune Tap’s recharge time by 10 seconds, but reduces the damage reduction it provides by 20%. Glyph of Runic Power: Whenever you are struck by a movement-impairing effect, you will generate 3 Runic Power every 1 sec for 5 sec. This is still early beta, so this list may well not be what appears when Warlords goes live. Glyph of Dark Succor – this is now a level 60 ability. Perks are enhancements to certain of you abilities. You receive these as you level from 90 to 100 in lieu of new abilities, and you receive them randomly. This means that your level 95 DK might have an entirely different set of perks from mine. By level 100 you will have all of them. Initially (in early beta) there were 9 perks per spec, now there are four. Maybe it’ll change again. All of these effects are passive. Enhanced Death Coil – Your Death Coil increases your heath by 3% for 30 sec. Enhanced Rune Tap – 10 second faster cooldown. Empowered Obliterate – Improved Howling Blast and Icy Touch damage. Empowered Pillar of Frost – 5% more Str and costs no runes. Improved Death Grip – your Death Grip target now automatically has Chains of Ice applied. Improved Runeforges – More damage from Rune of Razorice and more Str from Fallen Crusader. Empowered Gargoyle – 10 second longer duration. Enhanced Dark Transformation – your Dark Transform no longer costs runes. Enhanced Fallen Crusader – Rune of FC now heals for an additional 3% when it procs. So talents are not differentiated into blood,frost and unholy and they are all same to all dk but some different abilities due to spec. Is it right? Am I able to learn each time I lvl up?Or not? No, you’ll learn new stuff every few levels. New abilities will flash on your screen and appear in chat. So…talents are not needed any more? No, they’re still needed, as are glyphs. Hit N to bring up the talent page and click the ‘talents’ tab at the bottom. Then pick the ones you want. One per row. Hit the Glyphs tab to bring those up. Use our guides (or YouTube) for both or just pick the ones you want to try out. I mean there are only little rows as I have seen in images and webpages.So I want to know why it has been look like that? It’s just Blizzard making things easier. So you just click the talents you want, click the “learn” button at the bottom, and you’re done. So, talents are for learning abilities or for specializing the learned abilities? A set of abilities common to all members of the class. 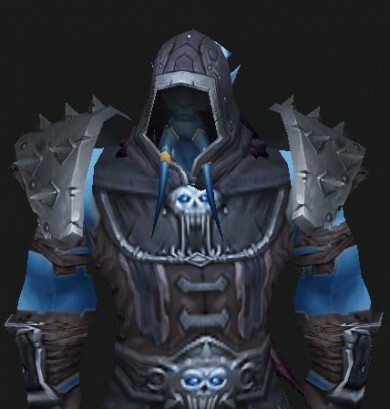 All Death Knights, for example will share certain abilities, such as Death Grip. A set of abilities for each “spec.” For example, only Unholy DKs get the ghoul pet. The talents. Any DK can pick from any of the DK talents, which is different from when you were playing in Wrath of the Lich King. Blood, Frost, and Unholy can all have exactly the same talents. You will automatically learn all of your abilities as you level, but you will have to pick your talents. Open up your talent page on your character (hit ‘N’, then the “talents” tab at the bottom) to see at which levels you will be able to get new talents. Can I start DK at lvl 1 in wod ? Heh. Nope. But they are making noises about not requiring you to level another character to 55 before you can have your DK. Hmmm… I suppose that it’s actually moot these days. Buy WoD, start a level 1, get the boost, and start a DK. All in 5 minutes. Thz… but I don´t that much understand about buying boost.Can I get it together with the wod disk?Or seperate? Hey, sorry to take so long. Yes, you get the boost when you buy WoD and install it, the version you buy doesn’t matter. Once installed you will see an icon on your character screen. You click it and pick the character that you want to boost. You will instantly be level 90, with some decent staring gear, and only a few of you abilities. You’ll then go through some quests to learn your character and acquire the rest of your abilities. If that character is already level 60 then any professions on that character will be boosted to 600. Well, thngs have changed just a bit since Wrath. 🙂 Mists of Pandaria uprooted the whole system and brought in the new one. It’s much simpler now. Warlords cut out a bunch of abilities and restricted others. Glyphs work the same, but now you get six instead of nine. Abilities are learned automatically, so you never need to visit a class trainer again. The new expansion is pretty sweet. Hop in and check it out.